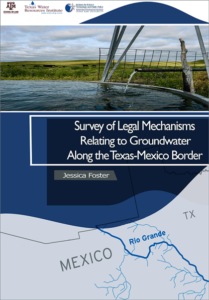 Jessica Foster's report on Texas-Mexico groundwater rules is published by Texas A&M School of Law! - KELLY, DURHAM & PITTARD, L.L.P. Jessica Foster’s report on Texas-Mexico groundwater rules is published by Texas A&M School of Law! Congratulations to KD&P associate, Jessica Foster, whose report on groundwater rules applicable to communities along the Texas-Mexico border was published today by Texas A&M School of Law! You can see the press release regarding Jessica’s paper here, and you can read the report here.